It wasn’t until after Andrew Heaney’s start in Tuesday’s 6-1 loss that the strained flexor muscle in his pitching arm became a significant concern. The left-hander said the ball felt different coming out of his hand beginning in the fourth inning, but he could still pitch effectively. When it was brought to his attention after the game that his velocity slightly declined during the game, he decided to talk with the Angels training staff, who discovered the strain to his forearm was worthy of a stint on the 15-day disabled list. 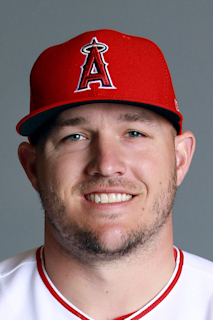 Centerfielder Mike Trout has been named American League Player of the Month for July and southpaw Andrew Heaney has been named Rookie of the Month. Trout batted .367 (29-for-79) with 12 home runs, 24 RBIs and 20 runs scored to win the third such award of his career. Most recently, he won it in June 2014. Trout slugged .861 in July, had an on-base percentage of .462 and an OPS of 1.323. Heaney went 4-0 with a 1.98 ERA in four starts. He struck out 19 in 27 1/3 innings.